These have been in the creative works for a while. How that works for me is first I'm inspired by something. 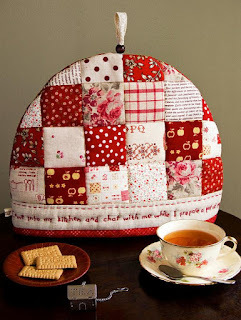 For these tea cozies, it was a photo on Flickr from Patchwork Pottery of a red and white tea cozy with an embroidered saying around the bottom edge. This tea cozy has been in my favorites for a few years and in the meantime, I've been collecting tea related quotes and sayings that might possibly work as part of a tea cozy. Next was to bring on my best hand writing - not an easy task as I rarely write by hand and if I do, it's a mixture of printing and handwriting that changes from day to day and mood to mood. After tracing the handwriting onto a piece of plain cotton (this is just off-white), I start to embroider a simple back stitch. I have tons of embroidery floss left from my cross stitching days, so I won't run out any time soon! Then I pick out fabrics for the patchwork above the stitching. Last, I quilt both sides and sew it all together. Tell me what you think? Should I make more? What colors do you like?